A website is the first step in marketing on the internet but it can also be a costly exercise. It is important to get more than one quote and also to view the portfolio of any website design company. Creating a website has two main components; the first is the design of the website or how the website will look and the second main component is the development or building of the website. The third main component of a website is marketing and it is essential that the marketing strategy be discussed in conjunction with the website design and development. Some examples of online marketing or online advertising are blogs, email marketing campaigns, Google AdWords advertising, Social Media and Search Engine Optimisation (SEO). There are a great deal more options to choose from but these are a good place to start for companies wanting to move their business online. Online Marketing should fit a business’s needs and through trial and error a strategy will form as to which methods work best for a specific business. Cost is a major factor when deciding which online marketing options to choose and much like other forms of advertising, a budget should be set. Some businesses have moved their entire marketing budget online whilst others are opting for a percentage of the budget to be spent through online advertising. Once you have an overall budget, this needs to be allocated to the various marketing options. Blogs are a good place to write content about products and services and can lead people back to the company’s website. They are reasonably priced to set up or there are free options such as WordPress or BlogSpot. Social Media is another cost effective way to get your product marketed. Facebook, LinkedIn, Twitter and Pinterest are just some of the sites that can be set up for free and products are promoted through pictures, videos and content. 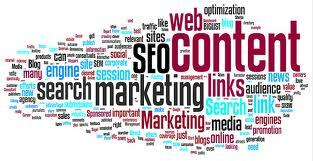 SEO or Search Engine Optimisation is generally done by an agency and the cost is dependent on the size of the website. Google AdWords is a cost-per-click method of advertising on the Google search engine. This means that every time an internet user clicks on an advert, the business which is advertising pays Google a fee. The fee fluctuates but once a daily budget is set, the total cost will not exceed that budget. Google AdWords can be a hugely successful marketing strategy whether you have only a few hundred rand or a few thousand rand to spend. The South African statistics of people online is staggering and the numbers are growing daily. With approximately 10 million South Africans using the internet, Online Marketing is becoming a necessity for business owners.